Dave Elger on Running, Racing and Training: Are Skechers Shape-Ups a Cure for Heel Pain? Are Skechers Shape-Ups a Cure for Heel Pain? I've had problems with plantar fasciitis for a while, so these shoes are a godsend! It is now hard to wear any other pair of shoes. Well worth the money. -review of Skechers Shape-ups on amazon.com. Recently I've been increasing my running, and while the majority of time I don't feel any heel pain running, I do usually have discomfort walking around the rest of the day. Today I think I've found the answer. 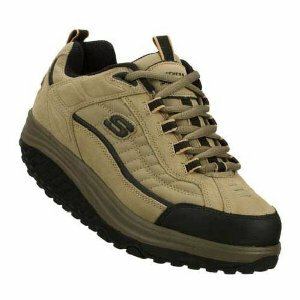 I tried on a pair of Skechers Shape-ups at the Camp Humphreys PX, and knew immediately I had to have a pair. All I can say is they are nothing I've ever worn before, and I can now forget about deciding which inserts to wear. They feel amazing! You need to order 1/2 size big.